Animals that are on the menus of other creatures generally have eyes set well back and to the sides of their heads. This arrangement gives mice, deer and others a wide field of vision, with the only bind spots being well to their rear. Predators, such as foxes and hawks, usually have forward-facing eyes, to allow for accurate focusing on prey. Jumping Spiders, which are both predator and prey, take vision a step further. Research recently published in the journal Royal Society Biology Letters establishes that their eye placement and function allows for a field of vision that is very close to 360 degrees. In effect, Jumping Spiders can see directly behind their bodies, to all sides, and forwards – simultaneously! In lab experiments, the spiders watched both videos and people’s actions with apparent interest (I’m not sure how much they understood, but then again I miss a lot as well!). As most spiders see very little in the way of detail, these advanced abilities are quite surprising. University of Massachusetts researchers discovered that the retinas of the 2 principal eyes are shaped like boomerangs. These retinas rest in tubes located within the spiders’ heads. By moving these tubes, Jumping Spiders can scan a very wide area about the body. This method of visualizing the environment has not been previously recorded. The principal eyes also see color and detect ultraviolet light. Ultraviolet light enhances the spiders’ colors, and plays a role in species recognition and courtship. Six secondary eyes, located on the sides and rear of the head, detect motion and detail, and also allow the spiders to see objects directly behind the body. 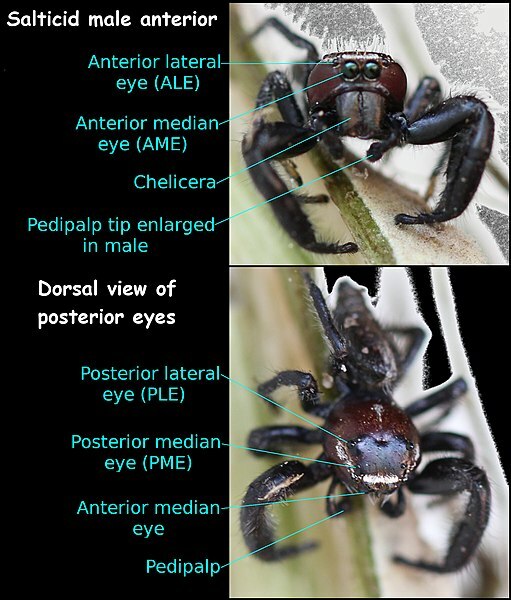 Researchers hope that further study will reveal how Jumping Spider brains process visual images, knowledge that may offer insights into the workings of our own eyes and brains. The Jumping Spider family, Salticidae, is the spider world’s largest. Nearly 5,000 species have been described, and many more, no doubt, await discovery. Jumping Spiders may be found in habitats ranging from rainforests and deserts to cities and seashores. I’ve collected several species, each varying in color and size, within NYC. I’ve always been fascinated by those Jumping Spiders known as “ant mimics”. Their bodies have an insect-like “waist”, and they move about with jerky steps, in imitation of their favorite food. Some even hold the front pair of legs upright, so that they seem to bear antennae! Thus disguised, they are able to approach ants without being attacked. I imagine the spiders also gain some protection from predators by being associated with ant colonies. Please see this article for photos of an amazing, huge-jawed ant mimic recently discovered in Borneo. In addition to stalking their prey with cat-like stealth, Jumping Spiders utilize other hunting styles. Several have been observed to take detours when moving in on a potential meal. Amazingly, these detours sometimes place the spiders in positions where they cannot see the insect being stalked. Whether “planning” or memory comes into play is not yet known. Several Jumping Spiders specialize in capturing web-building spiders, inducing their prey into striking range by vibrating webs in imitation of a trapped insect. Some even rappel into webs on silk strands! Unlike the large rear legs of grasshoppers and other notable jumpers, those of Jumping Spiders are smaller than the front legs. Rather than relying upon muscle strength, Jumping Spiders utilize hydraulic pressure to facilitate their amazing leaps. I cannot understand why so few spider enthusiasts keep these fascinating creatures. Active by day and extremely bold, Jumping Spiders will reveal much about their lifestyles in small, simple enclosures. In contrast to nearly every other spider, they will follow your movements with interest. The colors and mating dances of the males are thrilling to observe, and captive breeding is possible. Please post questions below if you would like detailed information on their care. Jumping Spiders are not known to be dangerously toxic, but should not be handled as their venoms are not well-studied. Spiders can be gently nudged into a plastic container via tongs when being collected or transported. Jumping Spider fans may also be interested in keeping the Giant Crab or Huntsman Spider (Heteropoda venatoria), a species I’ve collected and bred over many years; please see this article for further information. Hello, Im just curious as to the care of jumpers in captivity. Can I basically mimic a Tarantula care, mist keep humidity reasonable and good ventilation? Misting occasionaly for water should they need it? Fruitflies and pin heads? What about “communal” tanks? Any information would be nice. Thanks. 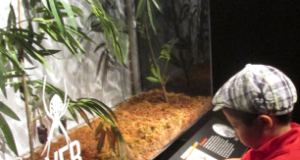 Thanks for your interest; Yes, keep as you describe…normal room temps fine for native species; you can feed various insects collected nearby or crickets, etc. They are esp fond of moths, flies, and interesting to watch them catch these. Can take soft-bodied insects that are nearly as large as spider itself. Provide upright bark slabs or similar for climbing; if given lots of space, climbing surfaces, several of same species may co-exist, although losses possible during mating. Nepenthes are among my favorite plants…. Though I’m not quite fond of spiders(yet! ), I caught a bold jumping spider (the ones with the green-ish fangs) and I was wondering how often to feed him. He has a nice home in a container with plenty of ventilation, some twigs to crawl on, dirt, leaves, and I mist it when it gets too dry. On the first day he ate a large fly but he hasn’t been interested in hunting since then, it’s been almost a week. Any tips? wondering how to get ahold of some jumping spiders to care for? can you buy them or do you just have to catch them? very new to caring for spiders but I love the little jumpers who I can usually play around with and observe for long periods of time before they get bored? My fiance tried feeding our jumping spider ants, he put 4 in the container with the spider and the ants attacked and ripped one of its back legs off 🙁 will he be ok? What can I do?? Ants are tough customers, especially in groups! Spiders eat some species, but best to avoid. The spider should be fine; the leg may grow back during the next molt. Our regal has been acting sick. She has a nice spider / sm. critter cage and she used to stay up in the corner but the last few days can’t make it to her corner and falls when she gets about half way there. She has been tucking her legs so i dont think she is going to molt and we keep water in her cage. Weve had her going on 3 months and im worried about her. What can we do to help her feel better? We completely cleaned her cage tonight top to bottom and lined the bottom with soil and rocks and instead of a real stick i put a fake one in because i was not sure if the twigs i had n before could have caused her to feel ill. She has a cave stone too with shredded paper towels to have a dark place to go. I don’t know what else to do. Plz help our Charlotte. I’m interested in any insight you could share on the breeding of jumpers, particularly the care of young spiderlings. Thanks! I have this regal jumping spider (named steve). he has been living in our room. how would you suggest i feed him. (my room is literally his cage. he enjoys climbing the walls.) we also have a cat that likes eating bugs so we have to watch the kitty. I’m interested in keeping jumpers but I’m not sure the best type of enclosure for them. I don’t want their prey to get out and I’m having a hard time finding enclosures with small enough vents or henge openings for feeding. Any suggestions? You can buy plastic insect screening in small rolls at a hardware store/home depo and attach this to the inside of the cover that comes with a standard plastic terrarium..use silicone or even duct tape, just make sure take in firmly attached so spider does not get stuck. Hey frank! Just wanted to know where you could possibly get a jumping spider around in Las Vegas. I have had at least 10 different types of jumping spiders but I usually would let them go. The only jumping spider I had the longest was all orange and fuzzy looking… So I named him cheeto… I had him for a good amount of time and then he or she molted and had black legs and an orange body wanted to know if you could tell me what type of jumping spider this is… Being a big fan of exotic animals and bugs/arachnids after cheeto died I asked my parents if they would buy me a truantula which I have… Thanks for any help and good article! There are a whole bunch of baby Regal jumping spiders living in a silken “sleeping bag” or sack on my mother’s rain coat (which is outside on the back porch) ( they usually come out in the mornings). i would really like to capture them and have them as pets, but my parents say that that will make them die. If i were to capture them, what should i do? And if i captured them, would it kill them? I caught a bold jumper and would like advice on what kind of enclosure would be ideal for it. I also wonder what their lifespan is, and if they over winter here in kentucky or if the cold kills them. I really like this guy so I want to keep him around and happy for a while. Thanks. Enclosure can be very simple…plastic terrarium sold at pet stores for small pets, even a large jar with a piece of rag or cheesecloth secured by a rubber band as a lid; a slab of bark makes a good place to climb, and it will hide on the underside of this at night. Spray with water once daily. Do not handle…bite is painful, and there’s always the chance of an allergic reaction. They overwinter during after their first summer…i.e. as sub-adults; in the wild, they do not usually survive a second winter. But captives may, at least if they follow the pattern set by similar spiders. Hi I found a tiny sling probably only on its 2nd or 3rd molt… I didn’t want to let her go because she is just to darn cute. but I was wondering if it would eat like the really small roly-polies? if not what should I try feeding it? I have a bold jumper named Dwayne. I’m wondering if you could share some information about bold jumper molting. How can I tell when he’s going to molt? How long will it take? I have 7 jumpers in a container, is it alright for them to be together? i go out in my yard and look for more because i love jumpers but i want to know if i should have separate containers. I have a cotton ball that i soak every 3-4 days and i spray the bottom every once in awhile, i have 3 crickets in the container with them atm but so far they haven’t eaten, i’ve had them for about a week and just got 4 more yesterday. i have special humidity moss i can put in the container to increase humidity if needed and i have plenty of containers and food available, i also hold them from time to time, knowing not to make to many sudden movements as disturbing them too much can make them bite. Any suggestions? They tend to get along only in large enclosures with many climbing surfaces and hiding spots. But even there, you may lose some..definitely will if they are of different species. Whether together or alone, provide bark slabs or similar surfaces so they can climb and can hide on the underside, or they will be stressed. Alright my container is about the size of an average shoe box, but i can get a bigger one if needed. I have 2 different species, the Audax and Regius but i haven’t noticed any fighting and its been about a week but i can separate them if it becomes a problem. Also if you have any information on how to tell what gender the spiders are that would be great, I would like to breed but i want to know if i have Male/Female spiders of each of the 2 species. Well, the largest regius I have has been lifting it legs high and so I guess that means its a male, I recently got another smaller regius jumper about 15 mins ago and just finished getting it with the others, Im thinking about getting them into a larger container as they like making their nests in the lid area and I don’t want to disturb then when I open it. i have a 10 gallon tank in the shed outside, would that be ok, or is that too big? 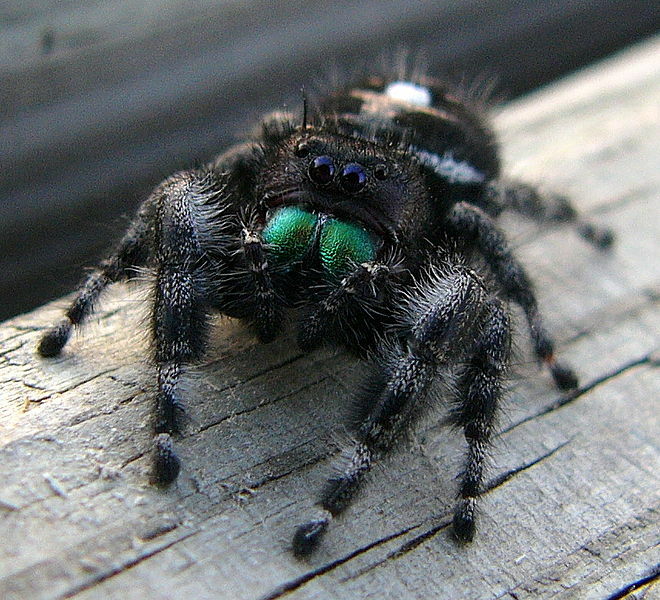 I would love to have a phiddipus audax. What kind of terarrium should i keept it in? And how should i go about cleaning the terrarium and taking car of my new buddy? They can be kept in a large jar or plastic / glass terrarium with slabs of bark for climbing and shelter and soil or sheet moss as a substrate; spray with water once daily and feed small crickets, moths and similar insects. No need to clean very much; sheet moss will often sprout when watered…if so, or if you use live plants, wastes will largely be broken down; some sowbugs will assist with this. Their fangs can break human skin, so do not handle. Should i buy more than one or are they better alone? Should i buy two or are they better left alone? While molting, one of my jumpers lost 2 of its legs will this affect him in any way? While molting, one of my jumpers lost 2 legs will this affect him in any way? I have been getting small crikets from outside but they havent eaten any of them and its been 2 weeks, today i plan to get some from the pet store and see if they’ll eat them. Also, a female made a nest under a peice of bark and a few days later a male made a nest over the top of hers, does this mean they are mates? They usually get along fine after eye injuries etc…often at the next molt the problem is corrected. Hi Frank I live in south east fla and have had an intrest in spiders for some time. I have been trying to find regals for some time with no luck. It is said that regals are very common here so i cant understand their absence. I have no trouble finding and breeding the rare red widow and other rare spiders, so what am i doing wrong. I have numerous spiders in my collection and would love to find these large jumpers because of their inteligence and appearance of personality. Any help would be appreciated. I have tried all habitats listed anywhere i find in books and internet and they all say the same. Please help! I have been looking for over a year now with no luck. I dont want to buy one because i want to observe and study it in its natural habitat first so i can recreate its enviorment. Also, if you know of anyone selling those little wonderful peacock jumpers from austrailia i would be intrested. Thier courtship dance and beautiful featherlike abdomen is amazing. Some look like aliens when their abdomen is extended. Thanks. Thank you for taking the time to reply. I guess i wont be able to find any peacock jumpers anytime soon here for sale in fla. I was hoping for a little information on where to find regal jumpers and canopy jumpers in the wild without purchasing them. I have tried every technique also. I hope they are not dissapearing like the european bees are around here. I find magnolia jumpers and even giant lynx spiders with the old branch beating technique all the time, but never the ones im looking for. Cant find them in grass, in the trees, on palm fronds, or in wood. Anywhere. Is there a habitat that you know of that they may be more common in that i may be over looking? Thanks again in advance. Gary Also i read your article below. You are very knowledgable and talented to have been surrounded by so many wonderful animals. A life i could only dream of. Thanks again for taking the time to respond to myself and anyone here who had a question. I lost the original blog I was on with you about my Green Frog. I was cleaning the pond and brought up my old huge Water Iris so I could prune and separate it. I saw a blob I thought it was some debris. You guessed it. The debris jumped and so did I. My frog did indeed hibernate in my pond. I am thrilled and can’t believe how much she has grown,assuming it’s the same frog. I lowered the plant back into the water. The life of the frog is more important than the plant. How long do they stay under water? It’s reaching low 70’s here with the water temp. in the low 50’s. Probably nothing for her to eat yet. I keep watch but so far she is still in the plant. Very interesting Brenda, thanks! Hibernation seems much more open to variables than I learned early-on; I once found green frogs overwintering below wet leaves…they survived! Water hibernation seems dependant on O2 levels, but again hard to be exact. How long they stay under depends on temp, O2…15 min or so in warm weather seems average, but longer, to all-winter, when cool. They breathe through the skin at that time, can do so even when warm to some degree. Just went to look at the pond and I see the green frog on the log I provided for her. I think it’s the same one as last year. Doesn’t look as big now that I get the chance to look at her. I imagine she will “dry’ out and look different as the season goes on. Nice to know I have another critter in my pond. This is my third year with the pond. I must be doing something right. Between Frank Indiviglio and Carolyn Weiss, the pond expert, I have lots of good advice. Couple quick questions. Can a green frog jump straight up 6-8 inches? Wondering if she can get out of the pond to find food. There is a log in there and the sides are stacked rocks. Should I make a ramp to assist her? In my youth hanging around creeks I remember something about frog spit. This morning there is a patch of frothy bubbles near where she hides. From the frog or my goldfish or just frothy bubbles. I combed throughy this thread lightly, lots of great info. I have collected two daring jumping spiders, first one lived about 8 months after I caught ‘her’ (I think it was a female), second one was caught last month and has molted once (that was interesting…). So my darling grandmother caught me another one while she was picking berries..and saved it for me. This one is more petite, but same markings and color and characteristics. I am not sure if it male or female. I would like to know if I can put them together? And if they were to mate what would i have to look forward to? Nice Grandmother!,…I was lucky that way also. there are many species, and sexes often differ in appearance, so it can be hard to tell..check a good field guide, or see if there’s a listing of species for your state online…bugguide.com can be useful. Thank you for the info Frank! I chose to keep them separate for now. The second one is small so I’m curious to see how he/she/it does molt and how long it will live. He (for the sake of its name I’ll refer to it as a him) ate his first cricket this morning..so hopefully he is settling in nicely. My green frog has grown since last summer. She’s out on the ramp I gave her so she can get out of the pond. Trying to get her use to me with out getting too close. How do I post a picture to this blog? I’ll send them to you in an email but I want to put them here. I don’t see a way. If you approach slowly each day, they eventually will accept your presence and remain still…eventually you’ll be able to toss insects close by if you wish. You were so right. Yesterday and today she let me feed her earth worms. Question. You’ve seen her size. About how much and how often should she eat? Over the past 2 days she has eaten about 5 small worms. Not sure if any small bugs have come in contact with her tongue. I don’t think she leaves the pond so it’s whatever worms and insects she gets. Do not want to over feed if there is such a thing. Doing lawn work I have found two more small frogs. Both about the size of a quarter. The dark brown one joined the green Frog in the pond. The other one is light brown with a lighter line on the head. It took off under the deck. Wondering if the two in the pond will get along as they are different types? My green frog is letting me practically hand feed her. Having fun with my pond. I can not believe my green frog trusts me so much I actually touched her yesterday. I feed her 2 or 3 worms a day. I can drop them right in front of her. Who knew a frog could be so much fun to have around. Thanks to you I have learned how to care for her and still keep her wild. Thanks for the update and kind words. Amazing how they adjust…after all, from a frog’s eye view, we are a raccoon-heron-sized predator, and the first instinct is to flee. I and my nephew toss crickets to bullfrogs living near his home…they stay very close, waiting for food, but if a turtle surfaces nearby or a shadow passes overhead, they dive underwater! Wonderful to hear of your new project…I did the same for many years…very interesting and rewarding. Just be sure to pay attention to the human health/sanitation concerns…some well-meaning folks tend to put the animals’ welfare before their own, which is always a mistake. Good luck and please keep me posted, frank. Was tickled to find your article & all the comments! My 11yo son & I share our apartment with a half dozen (at any given time) free-roaming Bold Jumpers these past 4 years. The living room resident is curious about absolutely everything – if it’s happening in his room, he’s going to walk up to it and examine it!. He’s the largest of the residents, and patrols the room, & 2 exterior doors, with guard dog precision. I came online to search if anyone else had experience with such a curious arachnoid. Bluntly put, he’s nosey! My son and I have spent many an hour these last 13 months watching him hunt & police his territory. It’s always a good laugh when someone new drops by and he comes from nowhere to center stage on HIS coffee table to stare them down + explore anything they’ve put on HIS table. My visitors rarely understand our fascination. When somebody does “get it,” we know we found a true friend indeed! I know he’s near the end of his life cycle, and I’m crossing my fingers that he will breed & pass on his marvelous traits. I’ve bookmarked you so we can continue to follow your engaging comments. About the well meaning folks. Now that Miss Green Frog and I are friends am I doing her a disservice by feeding her? Three or four earth worms a day? I really shouldn’t mess with Mother Nature but it’s the mother in me. last week our pit/lab dog grabbed a Juvenal squirrel and injured the spine. Took it to the local rehaber where it died as I thought it would. While I had it in my possession I pet and talked to it knowing all the while it was wrong in case it did live. That and the other part of sanitation/health should have been utmost in my mind. The lady and I talked at length about those kinds of things. May take me a while but I’ll get there. Can’t save them all is my motto now. I mainly want to know if it’s ok to be “friends” with the frog. Fine to feed the frog, as they are extremely adaptable as to diet…in dry periods, they may get by with a fraction of the food normally taken in, other times they gorge on seasonally available food to exclusion of all else (earthworms driven to surface by rain, cicadas emerging, etc); they adjust metabolism to food availability, and in any event yours is in a human-dominated environment. Hand rearing tends not to affect squirrels as strongly as mammals that rely more upon learning from parents…they usually revert to natural behaviors right away, although overly-bonded long term pets may have problems. I was mainly thinking of zoonotic diseases, parasites etc. In my quest to do right by my North American Green Frog I wanted to find out what other things she could eat. When looking for worms I find grubs and multi legged bugs and wondered if I should give them to her. Then I read where some earth worms are poisonous and only the frog knows the difference. Yikes! These are baby red worms as I know them. Since I couldn’t find a good answer as to what other bugs are ok I’ll have to ask you. Do you think she is eating bugs on the pond? Or am I spoiling her? One other concern. She is alone as far as I can tell. Is it possible a male will find her? From what I read it’s past their mating time. Maybe she’ll end up an old maid frog. She’s eating plenty at night..invertebrates of all kinds are drawn to water, fall onto surface etc.moths, sowbugs , slugs; so no need to worry about providing variety. Earthworms are a great food…some species are foul tasting, frog will spit out; will also instinctively avoid or spit out most native toxic species…ladybugs, stinkbugs etc; beetle grubs fine, some millipedes taken, others not. Please post any questions – researching on net very frustrating as there’s no filters…people just post opinions etc. Apple , banana etc left within reach will attract flies, moths, beetle also…I’ve done this often in outdoor enclosures. Female do not attract males with calls or scent…male may wander in, or she may leave if she hears males’ calls nearby. My son and I caught a jumper, I thought we’d keep him and learn about spiders. We have had a great time with him in the last week. However, I worry I am feeding him too much. In the last week he has eaten a fly, a small moth, 4 small crickets and 2 large crickets yesterday. Today he doesn’t seem so hungry and he is visably bigger than when we caught him. But when he’s hungry he puts both feet on the glass and watches you till you feed him. He has made himself a little Web hammock to watch what’s going on and seems otherwise happy. Am I doing him a disservice feeding him so much, and when we let him go will he be ok? I have had a wild-caught female P.audax (Bold Jumper) for a month now. She has always been far larger than normal and last night laid an egg sac. She is in a large Critter Keeper and has created her hide and egg sac in a corner that is attached to the vented lid and the base. 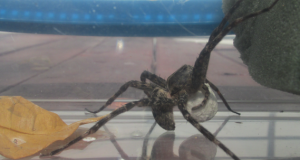 Do you know how long gestation will be for the babies, and if it is okay to move her and the egg sac? If I pull the lid of her terrarium up, it will tear the silk hide she made for her and the egg sac, but I can’t have tons of baby spiders crawling out through the entire vented lid. Thanks for the help! I have never personally obtained jumping spiders from any online vendor, they are usually pretty easy to find outside durring the spring and summer months. A simple google search should help you find a vendor. You can buy phidippus audaxs (along with other insects, arachnids, and feeder bugs) at bugs in cyberspace (http://shop.bugsincyberspace.com/). The bugs changes every other week or so, depending on how many are sold and how many are in breeding season. I’ve been told about small crickets from the pet store and all but is there a safe temperature that I could safely let him outside and he will not die?